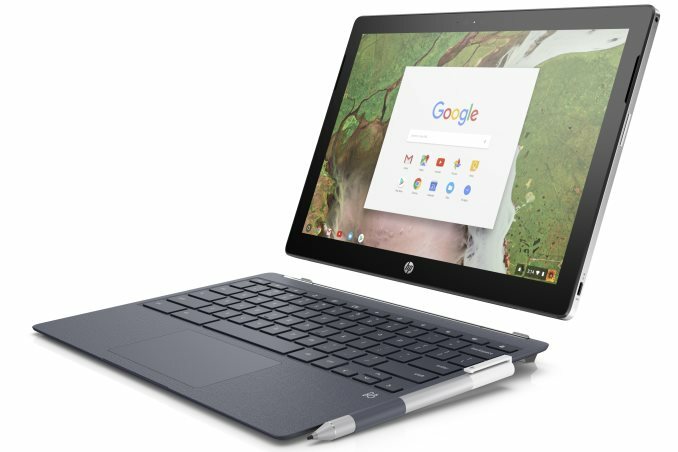 Chromebooks are still seen is one of the faster-growing segments of the PC category, and today HP is unveiling a detachable device with its new Chromebook x2. The Chromebook x2 claims to combine the functionality of Chrome OS into a more versatile form factor. The Chromebook x2 will feature a 7th Generation Intel Core-Y series processor, up to 8 GB of RAM, 32 GB of internal storage, and a 12.3-inch IPS WLED-backlit touchscreen. These specifications, along with access to the Google Play store, are aiming to provide users with a high-performing device for productivity and entertainment purposes in a flexible form factor. The exterior of the has a premium look to it with a ceramic white anodized aluminum finish and an almost leather-like Oxford Blue surface on the keyboard. The Quad HD (2400x1600) 12.3-inch IPS screen is said to have increased durability and scratch resistance with its Corning Gorilla Glass 4 touch display. Switching from a productivity mode to a creative mode should be seamless with its magnetic hinge. The hinge provides the strength and rigidity necessary to keep it attached and upright while in laptop mode, yet should make it easy to detach when transitioning to a tablet. The tablet section measures in at 8.2mm and 1.62 lbs (or 15.3mm and 4.14 lbs with the keyboard). Hardware wise, the Chromebook x2 uses an Intel Core M3-7Y30 processor (two cores with hyperthreading). The base configuration includes 4 GB LPDDR3-1600 and supports up to 8 GB total (although memory is not user accessible). Internal storage comes with 32 GB eMMC memory, expandable to 256 GB through a microSD card slot. Putting an image on the screen is the Intel HD Graphics 615 solution integrated into the CPU which is enough for Google Play games and entertainment purposes. With all this hardware, battery life is expected to last around 10 hours. For networking and connectivity, the Chromebook x2 gets out to the internet using an 802.11ac 2x2 Wi-Fi and supports Bluetooth 4.2 – no wired network options are available without a USB dongle. There is a multi-format digital card reader, two USB 3.0 Type-C ports, and a headphone/microphone combo jack for audio. When not using headphones, the Chromebook x2 has two integrated stereo HP speakers custom tuned by B&O Play. It also includes the HP Active Pen for sketch, blend, and write capabilities. The detachable island-style keyboard with an integrated numeric pad is backlit to help users working in darker environments. 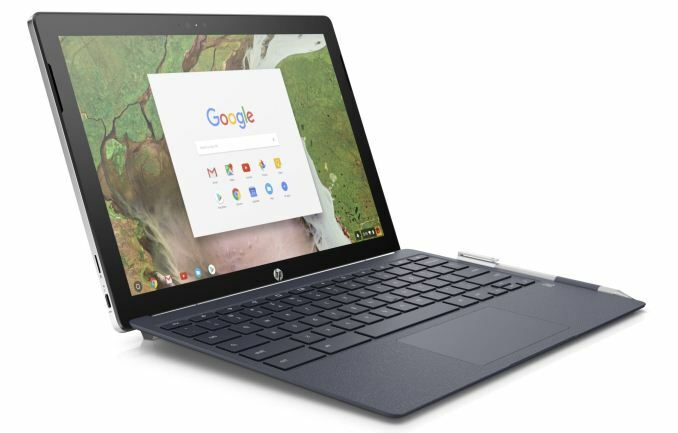 (W x D x H) 11.50" x 8.32" x 0.33"
Overall the HP Chromebook x2 looks like an interesting product offering users a new 2-in-1 option in the Chromebook ecosystem. 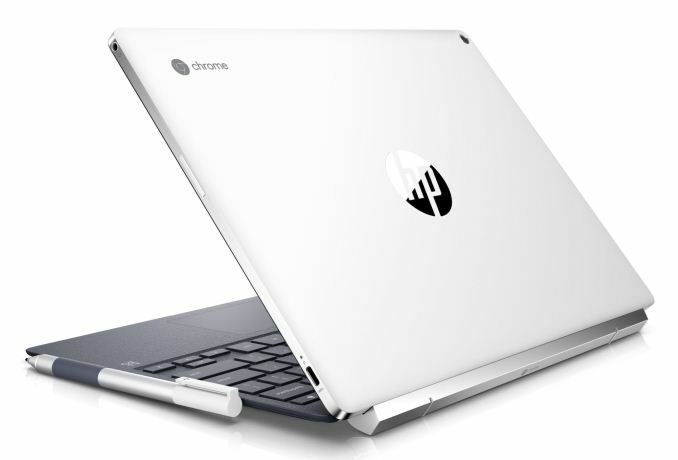 It will be available through HP.com and Best Buy on June 10th starting off at $599. Additional announcements from HP's Spring Range will be released in the coming days. If it's using a Core Y then it would already have hardware support for NVMe storage. Chrome OS is all about cloud storage (or at least that's how Google wants you to use it); the physical storage is there simply for the OS itself and any temporary storage of files. In fact most chromebooks bar the $1k+ ones have eMMC storage. Assuming the micro SD slot is PCIe based (it is on the 3 year old Baytrail platform, so I'm sure it is here) putting a cheap U3 SDHC card in will offer 150MB/sec of storage perfromance. Put into perspective, I can't think of a single Chrome OS app that's larger than 150MB.